It’s Secret Recipe Club time again! This month I was introduced to Sweet and Savory Tooth, written by Heather – a stay-at-home mom and avid cookbook collector (not to mention Disney fanatic). For the first go-round with Heather’s recipe index, I tasked the kiddo with coming up with his pick. He choose her Chunky Blonde Blondies. Of course, Heather is not gluten-free or dairy-free. So much swapping took place. And the kiddo made all the decisions, and he wanted to go whole hog – and make them not only gluten-free, but also grain-free. Consequently, we ended up with some delicious bars, but I didn’t really feel like they were close enough to the original recipe to be called just an adaptation. Back to the recipe index we went. This time I got to choose. And, because I’ve been eating far too many sweets, I choose something that I can’t eat. Something chock full of oats. See how I’m all sneaky that way? Of course, making this recipe DID require coming up with a vegan version of nutella. There’s no grain in that. The cookies, as the report goes, are delicious, though a bit crumbly. Next time I might up the flax seed a bit, and go with more nutella and less peanut butter. But, I was trying to stick as close to the original as possible. Thanks, Heather for providing oodles of recipe inspiration! Adapted from Sweet and Savory Life. Heat oven to 375 degrees. Mix flour, oats, baking powder, baking soda and salt; set aside. Mix Earth Balance, sugars and peanut butter. Add flax egg and vanilla and mix well. Add flour mixture into wet ingredients and mix until just combined. Slowly stir Nutella into the mixture. Place batter in spoonfuls onto baking sheet. Bake 10 minutes or until lightly browned. If you’re looking for more gluten-free recipes (especially chocolate ones) check out Gluten-Free HomeMaker’s Gluten-Free Wednesdays. 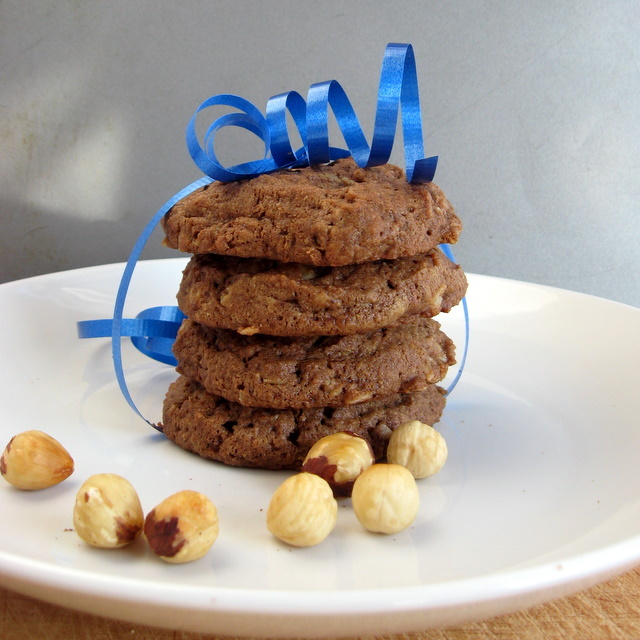 This entry was posted in chocolate, cookies, desserts, nuts, peanut butter, vegan and tagged chocolate, cookies, peanut butter, recipes, vegan. Bookmark the permalink. Love nutella! These cookies look fabulous. Peanut Butter and Nutella… they make my heart go pitter patter! I love this combo for cookies….. ok really … I love this combo for anything! Thanks. It was great fun to read through your blog with my kiddo and pick out favorites! What a perfect combination of flavors. I must make these soon. Glad to be part of SRC group C with you. Happy Holidays!! How could you go wrong with nutella and peanut butter? My mom is coming to visit and she is gluten intolerant. I’ll follow your advice…finally cookies we can make that she will enjoy. So glad to hear it! I love it when I hear back from someone that they actually made the recipe I posted. Yay! Hello! I am writing because I love your website and I am actually in the process of launching my own. I was diagnosed with Celiac disease recently, and started http://www.glutenfreedomblog.com as a way to keep myself organized as well as meet other gluten free people, and share what I have learned. The official launch party is coming up, and I am trying to spread the word. Tons of companies, including Kinnikinnick, Lucy’s and Bob’s Red Mill are giving away free products during the launch! I am asking if you could help spread the word in any way, from tweeting, to writing about it, Facebook, etc. People, yourself included, are encouraged to subscribe by email or through Google friend connect ASAP to get in on the giveaways! Thanks in advance! Came across your recipe and thought i’d suggest one for you. same but different. You can use half nutella/ half peanut butter. I’ve done that recipe before. Around here we call it the 1-1-1 recipe, and I’ve made it when visiting my mom, who has no funky gluten-free flours. Thanks. LOL. I hope you enjoy!